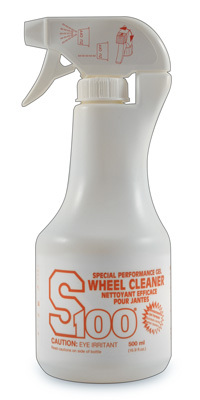 S100 Wheel Cleaner has 50% more cleaning power than Total Cycle Cleaner. Removes brake dust and grease from wheels easily. Safe on all wheels, including anodized, painted, and powder-coated finishes. S100 Wheel Cleaner has the cleaning muscle to remove brake dust and grime without jeopardizing the wheels' finish. Use S100 Wheel Cleaner on ALL types of wheels with confidence. S100 Wheel Cleaner is based on the same amazing formula as S100 Total Cycle Cleaner. The only difference is that S100 Wheel Cleaner has 50% more cleaning power to tackle the grime that accumulates on wheels. Spray on S100 Wheel Cleaner and allow it to dwell for several seconds. Use a strong stream of water to rinse wheels. Brake dust buildup may require light agitation with a soft wheel brush. Get clean, shiny wheels the easy way with S100 Wheel Cleaner.